3085L, CENTER CAP LEFT USED, 93-94, LINCOLN, MARK SERIES, DIRECTIONAL CHROME PLASTIC CAP, 20 INDENTS ON OUTER EDGE TO MATCH SPOKES, 5 PLASTIC CLIPS, WIRE RING, 7" DIA. FOR A 16", RIM. 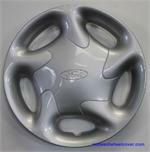 3130L, CENTER CAP USED, 95-97, FORD, PROBE, [LEFT] DIRECTIONAL CENTER SPARKLE SILVER 3 SPOKE WITH ETCHED LOGO IN CENTER. 5 PLASTIC CLIPS & WIRE RING. 3130r, CENTER CAP USED, 95-97, FORD, PROBE, [RIGHT] DIRECTIONAL CENTER SPARKLE SILVER 3 SPOKE WITH ETCHED LOGO IN CENTER. 5 PLASTIC CLIPS & WIRE RING. 3130r, CENTER CAP USED, 95-97, FORD, PROBE, [RIGHT] DIRECTIONAL CENTER SPARKLE SILVER 3 SPOKE WITH ETCHED LOGO IN CENTER. 5 PLASTIC CLIPS & WIRE RING. 7-1/2" DIA. 3229, Hubcaps used,14", 98-02, GEO, PRIZM, SPARKLE SILVER, 6 DIRECTIONAL SPOKE, FAKE LUG NUTS,NUTS, BOW TIE LOGO, PLASTIC CLIPS & WIRE RING. 3719a, LEFT Used Rims, 16x7, 5 LUG, 4-1/4", 96-98, LINCOLN MARK SERIES, DIRECTIONAL,10 SPOKE, PAINTED, ALLOY. 3740R, USED RIM, RIGHT, 15X6-1/2, 5 LUG, 4-1/4", 96-97, FORD, THUNDERBIRD, SPARKLE SILVER, 5 TWIN DIRECTIONAL SPOKES, ALUM, ALLOY. 63705, Used Rims LEFT, 14X5, 4 LUG, 100, 89-91, HONDA, CRX, ALUM 5 DIRECTIONAL SPOKE. 6539, Used Rims, 17X7-1/2, 5LUG, 00-01, OPT N94, PONTIAC, BONNEVILLE, CHROME, 6 DIRECTIONAL SPOKES. 65697R, Used Rims, 16X8, 5 LUG, 4-1/2", 91-93, DODGE, STEALTH. DIRECTIONAL TEAR DROP WITH DOUBLE POCKETS. 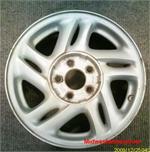 71636l, Used Rims, 15X5-1/2, 4 LUG, 115MM, 87-90, Acura, Legend, ALLOY 20 DIRECTIONAL SPOKE LEFT SIDE. 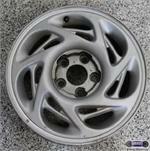 71636r, Used Rims, 15X5-1/2, 4 LUG, 115MM, 87-88, Acura, Legend, ALLOY DIRECTIONAL SPOKE RIGHT SIDE.